Teaching is really hard. One of the problems is that there are so many things to do and not really enough time to do everything in the way that we want. I have struggled to keep on top of all of my work and still retain anything like a fair work-life balance. From my experience, there are certain things which we may let slide – not because we are bad teachers but because we are human beings who can’t spend every waking hour on the job. The main reason homework has slid for me in the past is that I didn’t value it. It always felt like a waste of time as it didn’t seem to impact positively on my students’ progress. It is often the first thing to drop off the to-do list when I am busy and tired and working flat out. 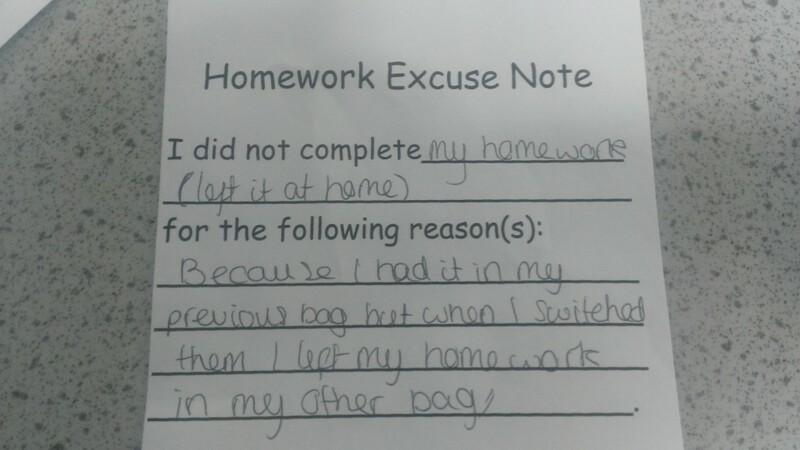 Whereas I would feel a deep sense of shame from not marking a set of exercise books, I can’t say I have ever been that bothered about forgetting homework. Homework can be time consuming to create, inconvenient to hand out, a nuisance to collect and a pain to mark! Hattie gives homework an effect size of 0.29 which seems to back up the idea that homework is ineffective. Homework matters to a lot of people. It is often a high priority for senior leadership teams and I have had many conversations with parents who cite homework as their number one concern. Ofsted state that ‘setting appropriate homework’ is a feature of outstanding teaching. These are obviously important factors but they are not compelling enough for me and have never led to me setting effective homework because they don’t really tell me why. To be clear, I am not dismissing any of these factors as unimportant, but for me to sustain any changes in the habits of my teaching, I need to see exactly what’s in it for my students. This goes some way to convince me that homework at Secondary could be effective and that if it involves rehearsal or practice it might be more worthwhile. From this I thought about the type of practice that would be effective for my students. Feedback based homework would be worthwhile, but I’m not sure that this meets my own selective criteria of homework being easy to prepare. I decided that a vocabulary focus would be a strong driver for improvement. Because I have read around the subject and because I value it highly, vocabulary homework is not something I will do half-heartedly so is more likely to ‘stick’. While the jury may still be out on the overall effectiveness of homework, I am now in a position where I feel that the homework I set is helpful for my students while avoiding the problems I have struggled with in the past. This is my current approach to homework. I trialled it with a couple of classes last year, have refined it and am now using it routinely. I am constantly reflecting on the benefits and as you will see below it is far from perfect but I am seeing the highly visible impact in the form of students’ work. I use the COBUILD dictionary and British National Corpus to create helpful definitions and example sentences. 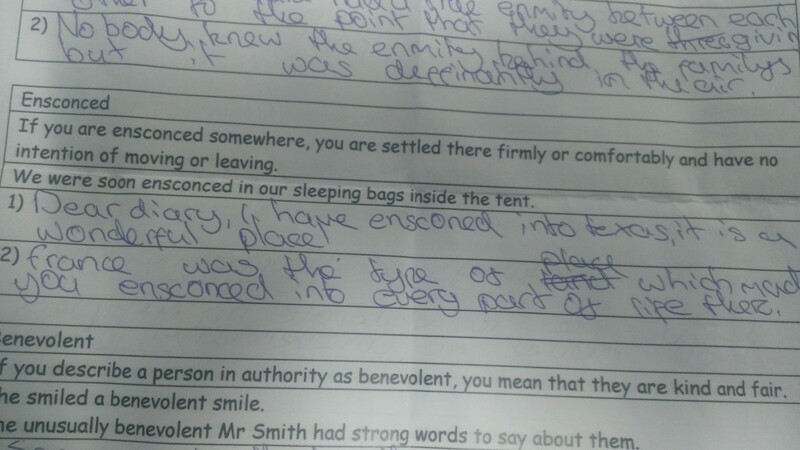 The students write their own example sentences as homework. The idea here is that students will take on these words if they are exposed to them several times. Many of the words chosen are ones they may be slightly familiar with and this additional encounter makes the even more ‘known’. You can see from the example below that the student is almost there but doesn’t quite have the precise meaning of ensconced. 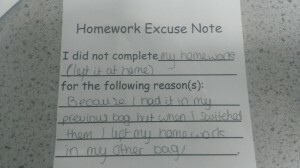 I have started using Laura McInerny’s homework excuse notes to help manage the handing in of homework and the minimising of non-doers. Then, some time after students have completed the homework, we use them in class, usually through reading them in the book/poem/article. The idea is that a further interaction with them will allow these words to transfer into students’ written vocabulary. I spend longer on the words that students struggled with in the homework. 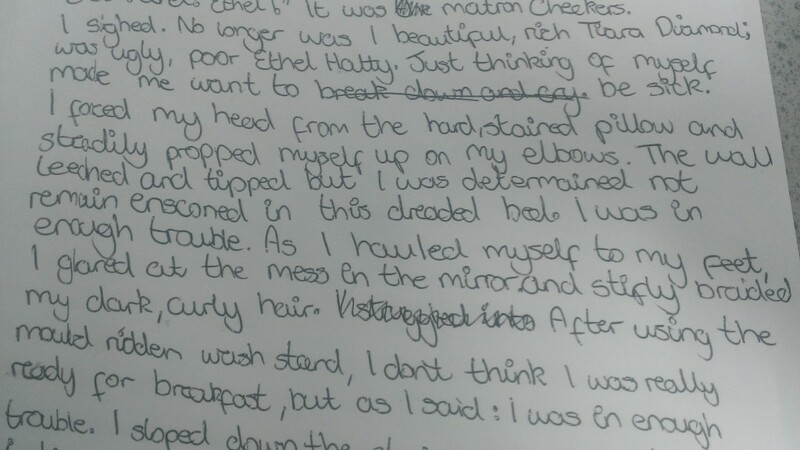 Then, I hope, students will use them unprompted in their writing as in the example below. 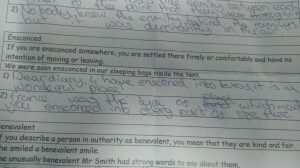 Although the spelling isn’t correct, it is clear that this student has reached for the right word and found ‘ensconced’. Or, the student deliberately found a way to use their new word. Either way, that student now has that word firmly in their written vocabulary. We know that most words are learnt from context and not through direct instruction. However, there is still a strong case for teaching individual words. While context is where the majority of words come from, explicit teaching of words will likely give students a greater command of those words chosen for instruction. The time needed to teach vocabulary is precious so we need to decide what types of word we should spend time on. A single encounter with a word will be unlikely to ensure full and rich knowledge. ‘Knowing a word’ starts from knowing just the sense of a word e.g. that ‘obnoxious’ has negative connotations. Students can then know a word in a particular context so they may know the word ‘argument’ in the sense of two people arguing but not in the sense of someone stating a case. They may then know what the word means but be unable to readily access it to use in writing. Then finally a student can have a full and rich knowledge of a word and ability to use it in a range of contexts. So when we talk about ‘teaching a word’, we are actually just incrementally increasing students’ knowledge of that word. And even that idea of teaching a word is a little more complex: students need new words for things they already know, new words for new concepts, new meanings for old words. One of the themes in To Kill A Mockingbird is prejudice. How does Harper Lee present this theme in her novel? First of all, students of English Literature should be able to understand what a theme is. They will also know what prejudice is, having studied the text. Obviously, these will be taught in class and as they are readily attached to concepts pupils will generally understand them. Some may understand ‘theme of prejudice’ only in the context of To Kill A Mockingbird however. The breadth of the course should allow multiple exposures to the word/concept of ‘theme’ and one would hope that a student has encountered that word before GCSE level anyway. The word ‘present’ is the most interesting word in this question. It is the type of word that will throw a student if they do not understand it. The word should therefore be taught. There are a number of these academic words that students will come across in a range of subjects. A glance through a GCSE Physics paper shows that students are required to understand subject specific vocabulary plus words like ‘discuss’ ‘explain’ ‘calculate’. There are so many words that students can be taught. As an English teacher, I want students to be precise in their writing. I also want them to be precise when responding to texts. 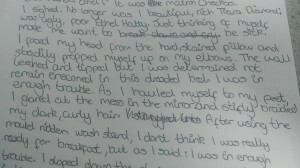 In the WJEC GCSE Unit 1 exam (reading) students are often asked the question: “What are your thoughts and feelings about x?” or “What are the writer’s thoughts and feelings about x?” A rich vocabulary allows students to be precise which helps when they need to make similar yet subtly different points. Usually they will be able to identify the tone but without a rich vocabulary they are unable to articulate the full range of thoughts and feelings. Therefore, I would recommend teaching a range of words which allow precision. I like Geoff Barton’s list as an example of complex sophisticated vocabulary for English Literature. Here is another great list of precise words about speech. Many words are introduced to students as synonyms e.g. a teacher could introduce a number of different replacements for ‘said’. Even though these are initially presented as having the same meaning there are invariably shades of meaning. ‘Uttered’ is not the same as ‘said’ even though it is synonymous. It is good to explore these words in relation to each other, e.g. by placing on a continuum or by asking students to choose the right words for a particular question. If the price of petrol went up would I be unhappy or apoplectic? If I saw an elephant would I describe it as colossal or enormous? Again, different subjects/ topics will have their own precise words. I wander thro’ each charter’d street/ Near where the charter’d Thames does flow/ and mark in every face I meet/ Marks of weakness, marks of woe. While the example above is not a word that students will readily use in their own writing afterwards, in most cases the words they encounter in texts will be transferrable and usable in a range of contexts. You wouldn’t teach every unfamiliar word from a text, especially a novel, but it is worth thinking in advance of words that are crucial to understanding or that are ‘high utility’ enough to be useful elsewhere. The best way for students to learn words is through multiple exposures to them in a range of contexts. Here is how I am planning to increase the range of my year 10 students’ vocabulary in the run up to their GCSE exam. I cannot spend a disproportionate amount of time so I have endeavoured to be as efficient as possible. 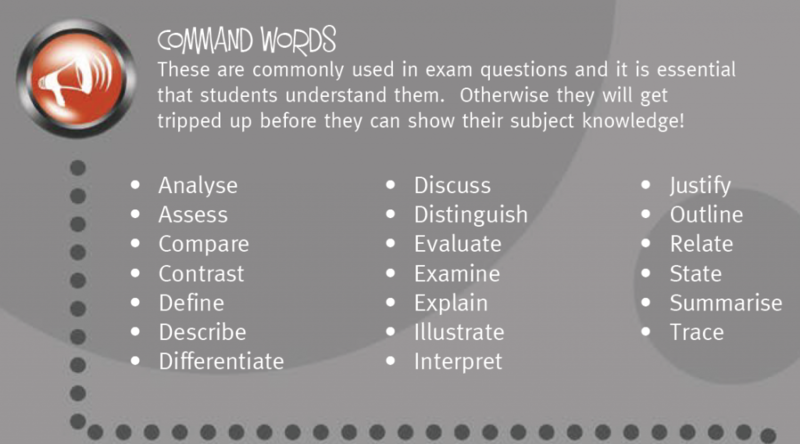 As an example, one of the past exam papers we will study provides many words ripe for instruction. I have chosen the following ten words: typical; hostility; nuisance; apparent; occasional; ferocious; compassion; indiscriminate; demonstrate; immediate. I have assigned this vocabulary homework for students to complete in advance of us reading the paper. The homework has a definition of the word in a sentence and then how the word is used. The definitional and then contextual information is crucial for understanding. The COBUILD dictionary has been of great use in creating this. They then have to use the word in two sentences. Then, when we read the exam paper, these words will be more familiar so the comprehension of the text will be greater. The multiple exposures to the words will help their word knowledge to increase and for these to move towards their readily used vocabulary. I have tried to select words that can also be used in a range of written texts to help students with their vocabulary in the writing exam. For my year 11 students, who are revising texts for their English Literature exam, I have tried to select words that can give them precision. For An Inspector Calls, I have selected the following: inevitable; prosperous; society; establish; typical; authority; denouement; consequence; compassion; demonstrated. I will also use these in my spoken language over the course of the revision on An Inspector Calls. The words will appear in my model answers and selected words (e.g. inevitable, establish, consequence) and will be used in further work on Of Mice and Men. I have given the words for homework but they could easily be a starter activity. In the previous post, I looked at how context can be used to understand vocabulary. In this post I look at a further two methods: dictionaries and word parts. Another way of checking the meaning of words is by using a dictionary. There are however, a number of issues with dictionaries. First of all, the primary concern with a dictionary is space; Definitions are often quite short and as a result they lose quite a bit of precision in meaning. Secondly, the language used in definitions is often quite complex-you can end up needing to look up further words to understand the one you originally looked up! Finally, you cannot guarantee that the students will properly understand the true meaning as this is often slightly different from the definition. Take this definition for example from my Oxford Popular Dictionary: Insinuate: v. Insert gradually or craftily; hint artfully. From this you don’t really get the sense of the word at all. It’s okay if you have a rough idea what insinuate means but very difficult to understand the meaning from that definition. I’m not advocating we stop using dictionaries but they are not always going to be the best strategy. Remember that many words have more than one meaning. Be sure to check all the definitions a dictionary gives for a word, not just one of them. Decide which definition makes sense in the passage in which you found the word. Often the dictionary works best when you already have some idea of a word’s meaning. This makes the dictionary particularly useful for checking on a word you want to use in your writing. I recommend teaching students about why and when to use a dictionary. I certainly don’t sit with a dictionary when I read. In fact, I tend to use a dictionary more for spelling. Wherever possible, we want students to be quite selective about words they will choose to look up. You will also need to teach them how to use the quartiles to find their words. VERB If you say that someone insinuates that something bad is the case, you mean that they say it in an indirect way. (disapproval) (V that) The libel claim followed an article which insinuated that the President was lying. insinuationN-VAR ( ) He speaks with rage of insinuations that he had been drinking that evening. To get around the brevity of definitions, I find that “define:word” search function on Google is actually pretty helpful. The definitions are fairly detailed and synonyms are also provided. Word Hippo is a useful site for looking up words and much much more. Students can often make tentative best guesses at words by looking at word parts. Those who are able to break down words into their constituent parts if necessary will be better readers than those who can’t. However, not all word parts are as deserving of time as others. Prefixes in particular should be worth considering.The following are the most common prefixes: Un-;re-;in-,im-,il-,ir- (not);dis- . These account for more than half of prefixed words. 20 prefixes account for 97% of words. It is worth devoting some time to the teaching of these. The most common suffixes are inflectional e.g. –ed, -s, -ing and students will be familiar with these even from oral language so they do not need instruction. Derivational suffixes e.g. ‘–less’ and ‘–able’ change meanings and students should be familiar with this fact, but teaching many of these is probably not an effective use of time. Latin and Greek roots may be interesting to teach but there are so many and they appear in fewer words that a disproportionate time would need to be spent on them. Sometimes the relationship between the root and the word is quite vague. There is an argument for teaching certain roots which may be of use in particular subjects e.g. mathematics or science. When teaching the meanings of words more directly, the origins of words can be helpful in making the words more memorable. Students should definitely be aware of trying to identify the root word of an unfamiliar word. Teachers can model this by taking a word such as bicycle and covering the ‘bi’ before asking students to add prefixes e.g. unicycle, recycle or look for connections with a word like cyclone. Students should be aware of strategies to help them understand meanings, including all of those mentioned above. The strategies won’t work all of the time but they will work some of the time if students are able to use them. A combination of different strategies will help. The first goal of comprehending a text becomes more attainable and the incremental ‘owning’ of words increases. Teachers need to think carefully about the texts read in class and how they encourage independent reading. They should also carefully think about the point of reading what they are reading. Areas where they are familiar with content will lead to more efficient word building. On a wider note, the argument for teaching more knowledge is overwhelming when it comes to reading comprehension and vocabulary building. The majority of words are learnt through reading and listening. However, just because a smaller percentage of words are learnt from direct teacher instruction, doesn’t mean we shouldn’t teach individual words. In the next post, I am going to explore the words we should explicitly teach and how we should teach them. In my last post on vocabulary, I discussed the vocabulary gap. This was the idea that students who know words tend to add more words quicker than those who have smaller vocabularies. In the next two posts I want to explore how the majority of new words are learnt and how we as teachers can help. Unfamiliar words do not hamper students understanding of what they are reading. Students build their vocabulary and ‘own’ more words. By owning a word, I mean that they understand its meaning and can use it themselves. When we take into account the sheer number of words students learn, we realise that they must get the majority of these from context clues. Word learning in this way is more incremental than instant-most of the words are learnt following multiple encounters with them in a variety of contexts. The chances of gaining complete ‘ownership’ of a word after one encounter are less but not impossible. If you had not encountered the word ‘solemn’ before, you would be able to assume that it is another word for ‘sad’. The context of Mrs Twit shrinking would also give clues. However, the reader would not get the nuanced meanings of solemn and how that is subtly different from ‘sad’. Another exposure to the word would probably do the trick. In the example above, you wouldn’t need to understand what the word solemn means to make sense of the passage either. But it isn’t always the case that context leads to understanding. Look at this example, from Loving and Giving by Molly Keane: ‘Solemn and clamorous, a choir of young people filed across the hall to the staircase.’ It would be difficult to glean the meaning of solemn from this sentence. In fact, you may end up arriving at a completely opposite meaning if you associate a choir with happy, joyful singing. A reader with a poorer vocabulary could make sense of it but may only really get that a choir moved from the hall to the staircase(assuming that they know the word ‘choir’). Enough to just get by but not enough to understand and then own the words. A further problem with contextual clues is that there gets a tipping point where students don’t know enough words in the passage to make sense of it and therefore any new words. Without comprehension of the text, they cannot make leaps of understanding. Less words=poorer comprehension=less words. So how can we help those with less developed vocabularies to use context to help them? First of all, encourage students to read and create many opportunities for them to do so. In addition, students should be taught lots of knowledge: knowledge of words but also knowledge of concepts, of culture and of history. As individuals, we can only address one part of a student’s schooling but this is not an argument not to do so. More knowledge will lead to a greater ability to understand words from context. Students should be taught to be able to distinguish between words essential to the understanding of the text and words which are not as crucial. An understanding of synonyms and antonyms will be helpful. In the example from The Twits, it is a synonym that helps the most. Students should be guided towards texts where they will understand about 90% of the words. This will help to ensure that they comprehend the text while still building a vocabulary of newly learnt words. It is quite difficult to get this exactly right. Some programs such as Renaissance Reading encourage students to read within their ‘ZPD’. As a way of increasing vocabulary development I am in favour, although I have concerns that the approach of choosing books in this way can lead to a lack of reading for pleasure. I would also encourage students to read non-fiction as language is much more functional in non-fiction and they are unlikely to encounter the nuances of language as much as in fiction. Also, in non-fiction, you are much more likely to come across examples like the one below where the word is defined within the text. The words in content areas like this are more readily attached to the concepts they are describing too. The right side of the heart pumps de-oxygenated blood (blood not containing oxygen) to the lungs to pick up oxygen. The left side of the heart pumps the oxygenated blood from the lungs around the rest of the body. We should model the process of working out meaning. To practice working out words from meanings, you could look at the British National Corpus and look at multiple uses of the same word. Students should also be encouraged to read around areas of interest and expertise. They are more likely to learn words in familiar contexts. If you look at the passage below, taken from FourFourTwo magazine, the vocabulary is quite complex. If you were a fan of football, you’d know about Luis Suarez and Liverpool and the words are more easily understood. He’s hardly the most likeable chap in the world, but Suarez’s mischief off the ball shouldn’t take away from his expertise on it. Silky and industrious, the Uruguayan was accused of wastefulness at the start of the season, but his goals are only a small part of his influence: his presence in an erratic Liverpool side threatens to shift them into genuine top four contenders. There are obviously other factors at play when reading and I acknowledge that reading a football magazine will not build the knowledge and cultural capital necessary but it will build vocabulary. And vocabulary is an important form of knowledge. This is the first in a series of posts about vocabulary. Some practical teaching ideas will follow. Here, I discuss the necessity for a focus on vocabulary as a method of ‘closing the gap’. 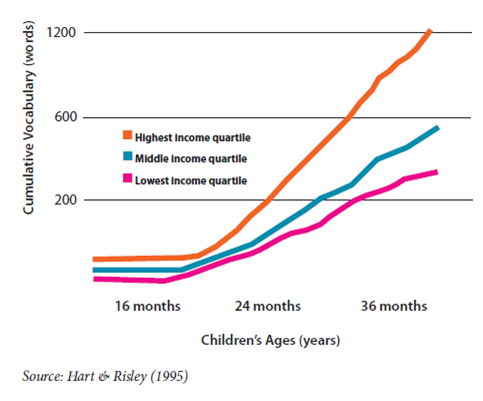 ‘The Matthew effect’, coined by the sociologist Robert K Merton, is the idea that the rich get richer and the poor get poorer. This is certainly the case with students’ vocabulary. 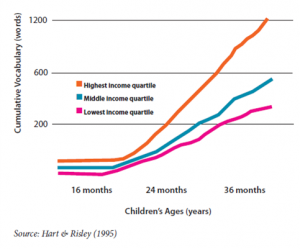 Hart and Isley’s study suggests that those in lower socio economic classes begin school knowing fewer words than their peers and that gap gets larger throughout their education. “Differences arise early, and the vocabulary gap between students grows larger over time”. (Baker, Kameenui 1998) A reasonable estimate would be to say that at the end of secondary school, high performing students know about 4 times more words than their lower performing peers. Steven A Stahl states, “Vocabulary knowledge is knowledge; the knowledge of a word not only implies a definition, but also implies how that word fits into the world.” When we are dealing with vocabulary, we are merely dealing with a particular kind of knowledge. Now, suppose two students are tackling a challenging text. The word-rich student will only need to juggle perhaps one or two new words whereas the student who knows fewer words will have to keep several new words and concepts in their working memory. The former student is much more likely a) to comprehend the text and b) add the newly introduced words to their vocabulary. More vocabulary begets more vocabulary. There is a strong correlation between vocabulary and reading comprehension. It makes sense that those with a richer vocabulary would understand a text. This will also depend on the depth of vocabulary knowledge as well as the breadth. There is also a reciprocal relationship between vocabulary and reading comprehension. Students who know more vocabulary will read more and those who read regularly will build their vocabulary. The adverse is true- those with poor vocabulary will read less. Vocabulary rich readers learn more words than vocabulary poor readers from the same amount of reading which is then compounded by the fact that those word-poor readers go on to read less. It isn’t just about reading- a wider vocabulary is helpful for students to be precise in their meaning. It is possible to be understood with a fairly limited vocabulary- I can get by in France because I have a basic French vocabulary. (See the Up-goer 5 project and this article for an idea of how we can communicate with only a basic vocabulary.) However, think of the synonyms of a word like ‘sad’: depressing, gloomy, miserable, cheerless, distressing, heart-breaking, poignant. None of them are true synonyms- they all offer degrees of meaning. This kind of precision is essential in writing and in thinking. To get the level of sophistication required for academic success, students need the vocabulary to deal in these degrees of meaning. Because of the uncertainty of any causal link, it is difficult to come up with the definitive way of making students learn vocabulary. E.D. Hirsch states that ‘the fastest way to gain a large vocabulary through schooling is to follow a systematic curriculum that presents new words in familiar contexts, thereby enabling the student to make correct meaning-guesses unconsciously’. He is against the memorizing of word lists etc. He explores his ideas on vocabulary at length here and I would thoroughly recommend reading it. There are arguments in favour of more direct vocabulary instruction, however. The method above may not always be the most helpful for students who are ‘word poor’ and there may be a need to spend time explicitly teaching vocabulary. Indeed, we cannot rely on students always being able to make these ‘guesses’. 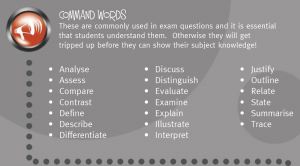 For example, the ‘command words’ below would likely need to be explicitly taught rather than discovered.